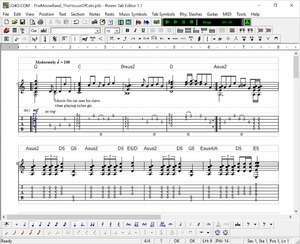 Power Tab Editor is a tablature-authoring tool for Windows. It allows for the creation of tablature scores that can be printed out and played back via MIDI. Features standard music notation and symbols as well as all of the popular tablature symbols. Can import MIDI tracks, and can export to ASCII Text, HTML and MIDI format 1 files. Version 1.7.80 is a freeware program which does not have restrictions and it's free so it doesn't cost anything. For security reasons, you should also check out the Power Tab Editor download at LO4D.com which includes virus and malware tests. Additional screenshots of this application download may be available, too.